The thought of shooting and editing video used to intimidate me. It seemed overly complicated, so I hid in the comfort of words. But one day, toward the end of my internship at The Dallas Morning News, I decided to stop hiding. I’m so glad I did. While in Dallas, I paired up with photographer Ron Baselice, a great mentor who let me help him shoot a video in the Dallas Cowboys’ locker room. Who wouldn’t want to keep shooting video after an assignment like that? A few days later, I came across what would become my first video story while walking through an apartment complex in Dallas. 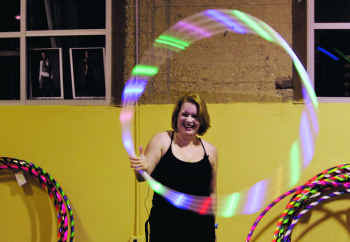 I saw a flyer for adult hula hoop gatherings and, hoping to relive a favorite childhood pastime, decided I’d see what they were like. After two classes, I was a hooked. I pitched a story about the gatherings to my editor, who thought the story had legs. She let me run with it, and said I could shoot a video to go along with it, too. I shot the video and edited it over a three-day period. The whole editing process took about 10 hours — for a minute-long video. I had edited audio a few times before and knew how to use Audacity and Garage Band, but I needed to learn Final Cut Pro, so the learning process took a little while. –Shoot wide, medium and tight shots. –Don’t zoom in and out a lot in the middle of a clip. –Hold each shot for at least 10 seconds. –Shoot relatively short clips. I sometimes shot 15-minute clips, which made the editing process more difficult. –Shoot from different angles. Lay on the ground, climb stairs, hold the camera up high, then down low. –Be wary of background noise. Shotgun mics can pick up more noise than you might think. –To the extent that you can, try to hide the wireless mic cord. It looks tacky when it’s hanging out from behind someone’s shirt. –Use a tripod or a monopod to help keep your camera still. –Get lots of natural sound. In the hula hoop story, I tried to capture the natural sound of the hoops falling to the ground. The adults I videotaped didn’t use hoops with beads in them, unfortunately. This would have made for good natural sound. –Test out your batteries before going out on an assignment. Make sure you have some back-ups just in case. –Remember that editing a video is much like writing a story. The approach is different, but the basic fundamentals are still the same. Your clips are your scenes. Your soundbites are your quotes. Every image, every word, matters. –Have fun, and don’t let video cameras, or Final Cut, scare you. Learning the basics of Final Cut really isn’t that difficult. If you don’t learn how to shoot and edit video now, you’ll regret it later … and you may never get the chance to go into a pro football team’s locker room! Here is a link to my story and video. On to the next video! What tips do you have for shooting video? This is both bizarre and awesome at the same time. Maybe the Navy should look into it. I think you did a great job on the video! I had a blast working with you. Email me your new address in Florida so I can send you a housewarming pressie.